I was going through some draws in my room earlier today and right there in front of me was a tag that looks to have come off an item of clothing, the tag says “grace”! Weirdly enough I have never seen this before, and I stood there for a moment and just smiled! It’s funny how we see things in moments it touches us the most and for me it did. Grace! of course! So I took a photo of it and decided to use it in thought and in writing as I reflect and look back on this hard past week. 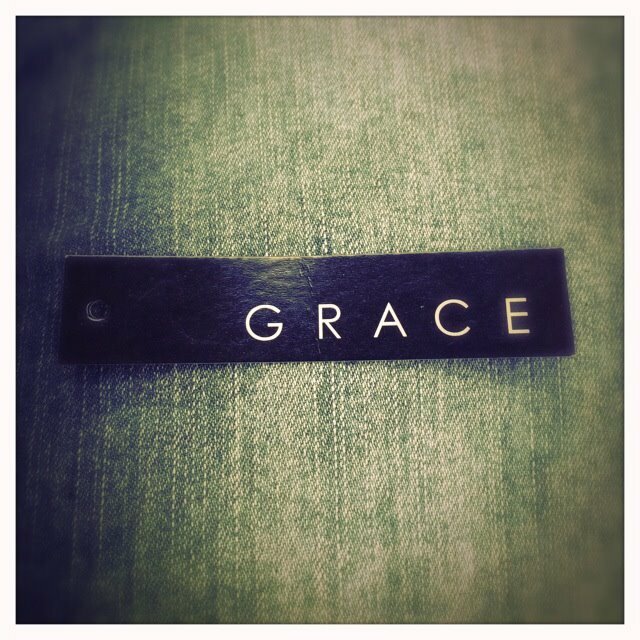 Seeing this tag and the word grace just reminds me of what grounds me, and what this life path is all about. What is always there for us if we just fix out eyes on its truth. This has been a really hard week for me. I have gone through and struggled with a range of emotions both past and present and this is the struggle of my life at times. It comes and it goes, and I truly believe I will always deal with this on some aspect, but at what level? Being a victim of abuse and living the life that I endured, there are times when a struggle is not just a simple struggle of moving past a bad moment, it’s more than just having a bad day that a little cheering up can fix, it’s fighting for what you know is true vs the lies from the past!! Its a hard process; a process that therapy and healing is helping me to work through. When I go through these hard moments of feeling disconnected and distant, it’s me working hard to get back to what I have worked so hard for all these years. It’s about finding those “new messages” and “hope” and “grace” that I have learned over the “old messages” and sometimes it’s a painful process getting there. I have learned over the years that no matter how much wisdom I have gained, or how much healing I have done, there will always be the moments like I had last week where the struggle seems bigger than the healing, and the work that goes into keeping your head above water in the truth and not letting the lies from the past pull you under. This past week was about fixing my eyes on the truth and grace around me, to see and feel the support and love that surrounds me, and the amazing connection that surrounds me – even if it doesn’t feel like it in the moment, its here. It’s a constant battle, and those who go through it know the process just like I do. That is why I write; to reach those who do have and go through the same process. I write and give voice to these moments so that you know your not alone, and my own writing validates that I myself am not alone. Sitting here on Sunday morning I am on the other side of the hard week. I found a shift and that gave me strength. It all comes back to grace. It’s like riding a really big wave and your stuck on it hoping you wont get pulled under. Sometimes you do get pulled under and you fight the wave to get above water, and then there are times you are riding the wave for a long time waiting for it to calm. No matter how many times I go through these hard moments, I know and I truly believe there is another side to it. I think healing has taught me that. In the past I only saw it as “I am going through a hard time, and this is where I am no matter what” .. healing has taught me to “ride the wave” knowing there is a calm at some point, and sometimes it takes a shift to come out on the other side. It call comes back to GRACE and what you set your heart to believe. Grace is found in the messiness of life, and grace is found in the goodness, you just have to believe in it and trust it’s process. I am sitting here Sunday morning and I am finding a sense of relief. I am supported and cared for. My support has never left me astray in this. My therapist has often told me “if you lean into what you know vs what the past is telling you, you will find connection and goodness and care and love” and he’s right. When you are struggling just try and remember that it all comes back to Grace, and no matter how dark, there is light, there is another side to the hardness. Sometimes just holding that belief is enough to get you through it. I like what you said…”Grace is found in the messiness of life” as I sit here at home in the midst of cleaning and decluttering. I work in a shelter for battered/abused women and their children. I see how truly messy life can be. Hi Linda … YES I bet you have seen the messiness of life with the job you do .. I work for CASA, I am a child advocate and the stories you hear and see of parents abusing children is just HORRIBLE.. you need to believe in grace to move through some of the things you see. Thank you for stopping by and connecting with me.. that means a lot ..
Grace … by His Grace … we are all loved, forgiven, and redeemed. thank you for that great reminder cindi :) thank you for stopping by ..